Menus at El Oceano Beachfront Restaurant. Our À la Carte Menu is a mouthwatering selection of only the freshest, especially selected ingredients. Our Head Chef takes pride in his creations and rightly so! A more relaxing lunch time you could not imagine. Enjoy the full à la carte menu, or choose something from the ‘lite-bites’ lunch menus. Lunch or evening meal, let our menus take you away on a outstanding culinary journey!! Available every day and every evening, our À la Carte Menu is a mouthwatering selection of only the freshest, especially selected ingredients. Our Head Chef takes pride in his creations and rightly so! A inviting menu of beautifully prepared seafood dishes, prime steaks cooked ‘al gusto’ (to your liking) plus a whole lot more. 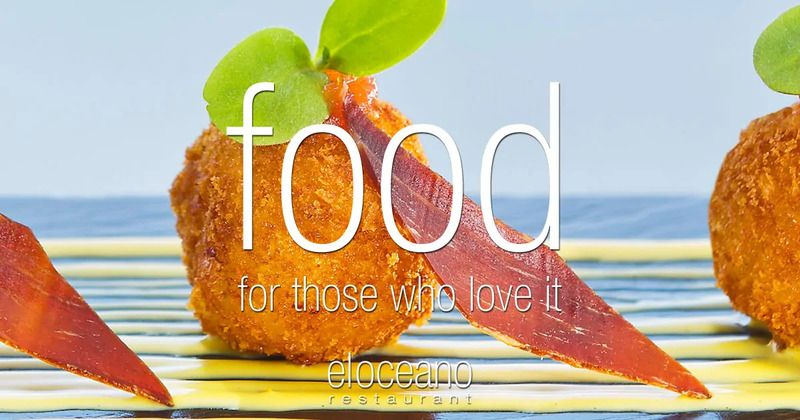 So please, discerning guest, take a look at the El Oceano Restaurant Menus. A more relaxing lunch time you could not imagine. Two menus are available at lunchtime, enjoy the full a la carte menu, or choose something from the ‘lite-bites’ lunch menus. If you can take the day off, there’s no better place to enjoy lunch. If you have the time – and inclination! – you could spend the afternoon with us too! ‘Awesome Afternoons‘ at El Oceano are, well… awesome! After lunch, stroll down to the pool bar for a cocktail, bottle of champagne or whatever whets your metaphorical whistle, in one of the most beautiful beach terraces on the Costa del Sol. Maybe even take one of the VIP sunbeds! As a lunchtime guest, you have full access to the terrace and pool area. bean sprouts and hoisin sauce. A Spanish favourite! Juicy prawns in hot garlic oil. Full mixed salad, topped with Tuna. Mini Romaine lettuce, anchovies and Parmesan shavings. Add strips of grilled chicken. Hand ground steak in a bun, served with hand-cut chips & salad garnish. Choose from three mouthwatering breakfast options, Continental, Traditional English and – best of all – Smoked Salmon Hollandaise. No better way to start your day! Served between 8am and 11am, breakfast at El Oceano is a special occasion in itself! Breakfast is available to non-guests, but please be aware that resident guests will be seated first. If you would like to enjoy breakfast on the waterfront, please enquire first. Our favourite of all our menus! The new Martini Lounge offers a fantastic list of classic and specialist menus.